Things have changed in the toddler fun biz in the more than 25 years since I tried to find something for my preschoolers to do. 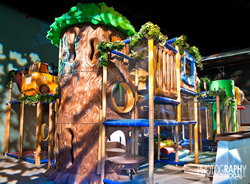 Now, there are indoor play parks for kids that will suit almost any age and accommodate every budget. Services can include anything from babysitting to Karate lessons. Whether you are trying to escape the bitter cold of winter or the blasting heat of summer, an indoor play park provides a great place to settle in for a couple of hours with your kids. The obvious benefit to bringing your child to an indoor play is that you are taking the mess out of your own home; though it could also be an opportunity to teach your kids to put things away as they finish using them. As well, your kids can have all the benefits of playing with a variety of toys without you having to buy them. It is a great way to see which ones they like and use, and which ones they discard after five minutes of play. If your kids are of an age where they can play independently, then you can take the opportunity to sit and have a tea or coffee and read or socialize while you monitor the kids at play. If the place provides free wireless, you might even get some work done while the children play. Many play parks offer party packages, babysitting, before and after school programs, or classes for kids or parents that are reasonably priced and give the whole family something to do. March break or summer camps are also popular services that play parks offer. A little girl climbs down from a swing and runs to find the dolly she had set down prior to getting on the swing. To her dismay, another little girl has picked up the treasured item and is playing with it. She knows that she can’t claim the doll as hers, since it’s communal property, and a look of dismay crosses her face. When the second child, who is older, sees the younger girl’s disappointment, she holds the doll out to the child and tells her she will let her have it if she can have it back again later. Kids at Sea has an environment conducive to cooperative play. It is a contrast to the more physical and boisterous environments found in other parks, though those types of parks do also provide hours of fun for kids. But it all depends on what you are interested in when you decide to take your child out for a day of play. What is your goal when going to the indoor play park? Are you planning to play with your child, or watch from the sidelines as your child plays and interacts with other children? Depending on the place, your child may want more interaction with you or require more of your supervision. How old is your child? What age range does the park cater to? If you go to a place that is geared to older children, a toddler will be overwhelmed and there will be tears when he/she can’t keep up with the older kids or doesn’t understand what to do with a game or piece of equipment. What costs are involved? Some places charge by the hour, others will have a rate for the day that includes in and out privileges. Some have free wireless Internet, as The Funnery Play Park & Café in Newmarket, Ontario does, but some may charge for this. Some places require that you buy tokens to play games, while others have a pay-one-price that covers virtually everything your child will do. Will you be buying snacks, drinks, or meals while at the park, or will you bring your own? Some parks will allow you to bring your own, but there may be rules about what you are able to bring into the park. Peanuts are likely banned in any facility. If you are buying your meals or snacks, what does the facility provide? Some have cafeterias with full meals, while others only are able to offer snacks and drinks. Many of them provide only fast foods or junk foods, though sometimes there will be pleasant surprises, such as the gluten-free snacks I found at The Funnery. If you are very picky or have a restricted diet, bring your own food. If the facility has a “no outside food or drink” policy, talk to the owners about your special needs. Most are happy to accommodate. Are you looking for educational activities? Physical activities? Quiet play? Some environments are quite raucous and stimulating, so if all you are looking for is some quiet play before nap time, choose your destination wisely. Perhaps what you are really looking for is the library. Do you have more than one child? Do you want to stay for one hour or the day? Some places give discounts to siblings. Some will charge a small fee for one hour and a flat rate for the day. Investigate your pricing options. Whatever destination you choose, the playground should be a safe and clean place for your child to play. All play parks will have a list of rules guests must follow to ensure that everyone has a safe and enjoyable experience at the park, though the children may not be happy with some of the rules. According to Sam, the rule that kids baulk at the most is the rule about no costumes or toys on the large pirate ship. This rule comes from the Health Board and must be enforced, much to the disappointment of kids who want to dress up as Peter Pan and Captain Hook to play on the ship. Another rule common to play parks requires that shoes be removed to go into the play area, and that socks must be worn at all times. Some parks have socks for sale so that those children who have arrived without socks can still go in and play. Most parks have security cameras and alarms in place, and some also have a coding system to identify which child belongs with which adult. When it is busy, kids can get separated from their parents in a large facility, so having something in place to ensure that children can only leave with the person they came with provides reassurance. The best way to find a great play park near you is through word of mouth. Ask other parents if they know of any indoor parks nearby. While these parks do advertise, it was through word of mouth that I discovered both Kids at Sea and the Funnery. Local newspapers and magazines are also a great source, as this is where the parks are likely to advertise. When doing an Internet search, try different keyword phrases to describe what you are looking for, and include the name of your town/city and state/province in the search. Use quotation marks around your search phrase to reduce the number of results returned if you are getting too many irrelevant results. The play parks available today provide hours of safe, fun play for children at reasonable prices. If you are searching for something to do, and you don’t mind paying a small entry fee, then consider a pay-for-play indoor park. Many of them have educational toys and all of them are bigger, better and more fun than the free play areas found at malls or fast food places. Search your town for these hidden gems, as sometimes they can be the best-kept secret in your own backyard. Kids at Sea (Accessed December 8, 2011). The Funnery Play Park (Accessed December 8, 2011).